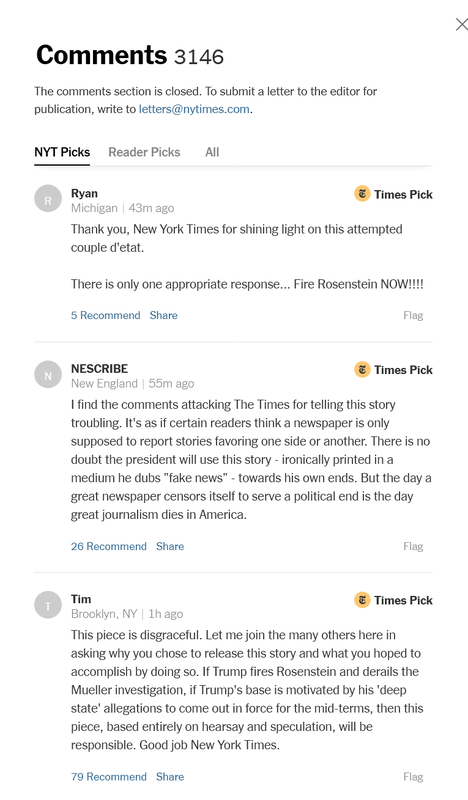 stock here --- When I first read the NYT article on Rod Rosenstein it immediately struck me as "too true". There use of an anonymous source was also disturbing. Since then it has been seconded by other parties that this is indeed an attempt to "bait" Trump into firing Rosenstein, with negative airplay and allegations of "disruption of Mueller, obstruction". Rosenstein will be toast when the de-classification is done, which is being done by the IG, solely for the purpose of not allowing the argument that "Trump did it" and therefore it is obstruction of justice and of Mueller. 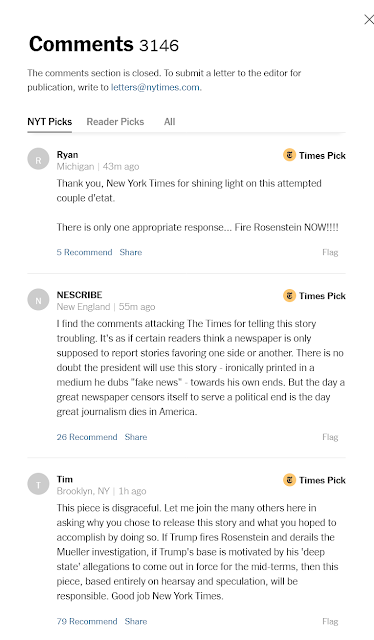 So I immediately assumed that it was a hit job, with 2 or more purposes: also look at the NYT "picks" of comments, they use their picks to highlight the narrative that they intended. Then when the Daily Beast (a full on liberal Anti-Trump narrative source) ran a similar article, I knew their game plan. 1) Have one article that they can point back to, to prove that they are "fair and impartial" and to be used in an anti-monopoly anti-trust lawsuit to break them up in some way. 2) Get Trump to rashly fire Rosenstein, and then my spidey sense then says that someone else debunks that story, but the "damage" is already done, and they somehow spin this into obstruction and impeachable offense for Trump. Or maybe simply damage for the midterm elections. See below video, by semi wacky George Webb who uses a ton of intuition. He is all about the Deep State, and Weapons and Drugs as being driving forces throughout the government.